The Philadelphia Eagles selected CB Sidney Jones with their first pick of Day 2 of the draft Friday night. Jones injured his Achilles at his pro day in March and his availability early in the season is up in the air. Otherwise, he would have been in the discussion for the top CB in the draft. He did not allow a touchdown in 2016 and just one score in 2015. Jones allowed a passer rating of just 42.1 when targeted in coverage, the lowest among all draft-eligible Pac-12 cornerbacks. Jones gave up a reception once every 18.7 snaps in coverage, the 10th-best rate in the draft class. 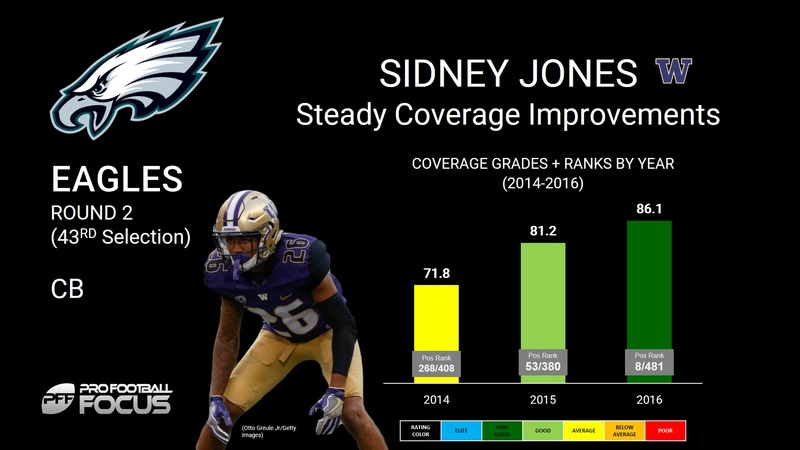 Jones may miss part or all of the season, but once he is healthy he will solidify an Eagles’ cornerback group that was a major weakness in 2016. Last year’s cornerback group picked off just three passes while allowing 13 touchdowns and a 102.6 passer rating when targeted in coverage.